Determination of landing site candidates! TopicsDetermination of landing site candidates! 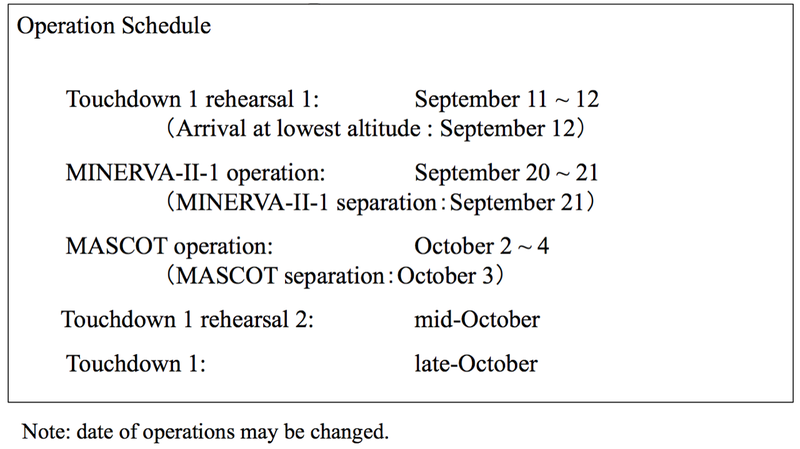 The Landing Site Selection (LSS) conference was held on August 17, 2018 and the candidate landing locations for touchdown, MASCOT and MINERVA-II-1 on the surface asteroid Ryugu were decided. In this article, we introduce the landing candidate spots and the planned dates for these surface operations, along with details of the selection. 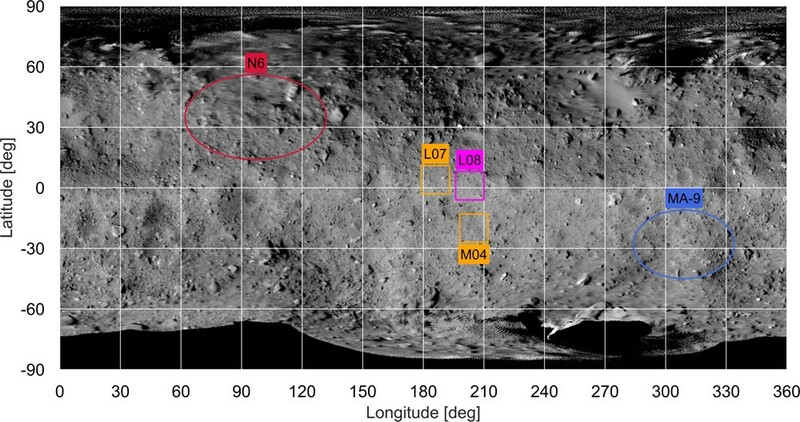 Figure 1 is a map of asteroid Ryugu showing the landing candidate locations. Please note the direction of north and south on this map (Note). Figure 1: Candidate landing sites. Image credit for the map of Ryugu ※: JAXA, University of Tokyo, Kochi University, Rikkyo University, Nagoya University, Chiba Institute of Technology, Meiji University. University of Aizu, AIST. L08 is the first choice (primary) candidate for the mothership’s touchdown, with L07 and M04 as back-up options. The designation “L” and “M” refer to low latitude (L) and mid-latitude (M) positions. The “L” candidate positions were selected from among 13 preliminary candidate sites, while the “M” location was chosen from a set of four candidate sites. The size of the site selection rectangles are approximately 100m. 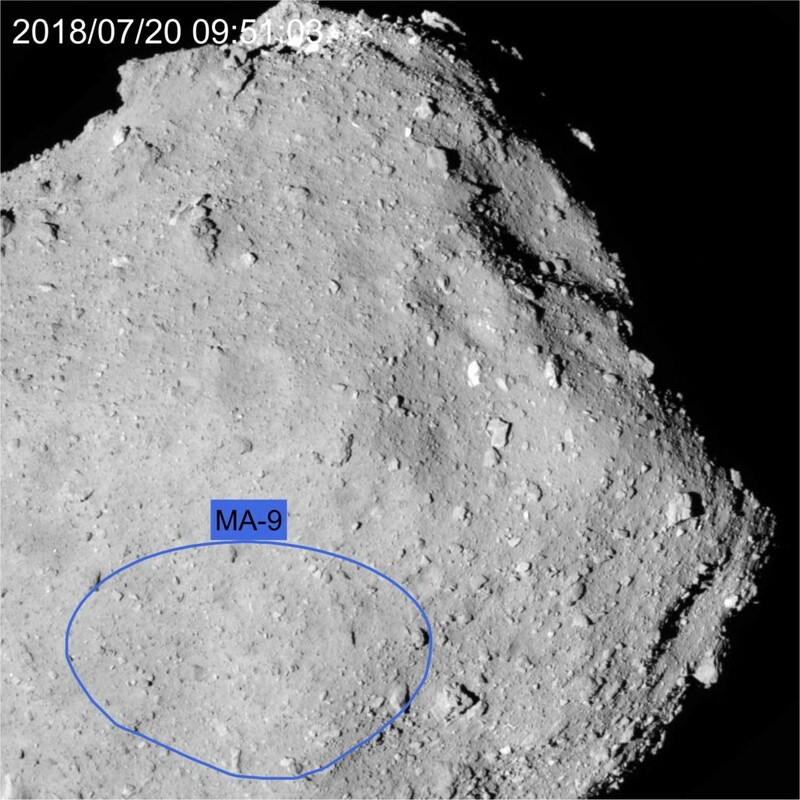 MA-9 was selected as the candidate landing site for MASCOT from ten possibilities, while the N6 candidate for MIENRA-II-1 was chosen from seven surface locations. In Figure 2, each candidate region is shown on the ONC-T image taken during the BOX-C observations at an altitude of 6km. Also in this image, the top of the asteroid is the north pole (Note). Please do note this is the opposite to the publicly released images so far. 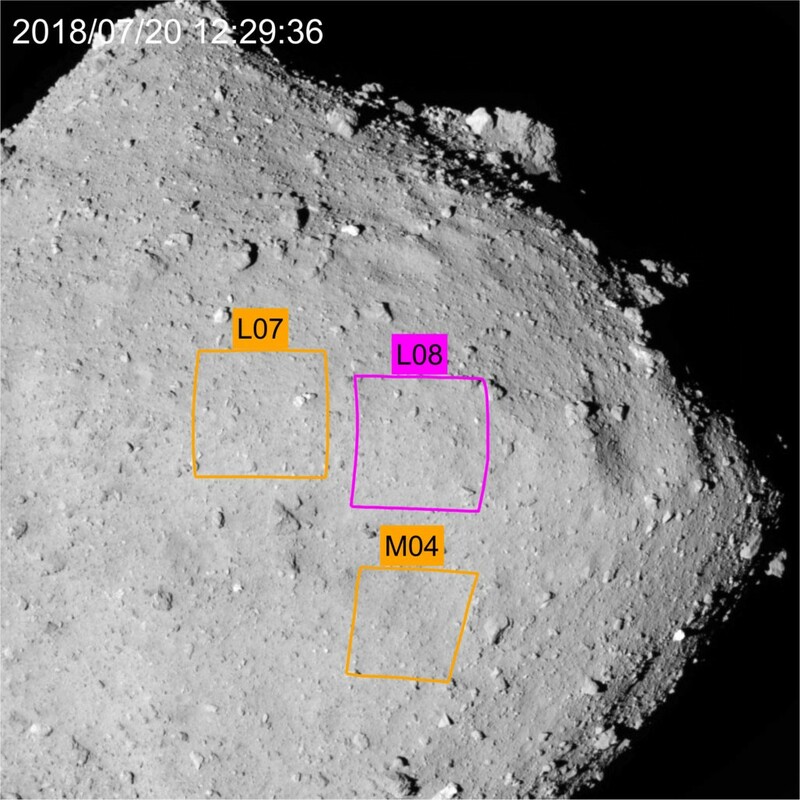 Figure 2: Candidate points marked on the image of Ryugu captured from an altitude of about 6km. The image was taken on July 20, 2018 by the Optical Navigation Camera – Telescopic (ONC-T). [Note] On the map shown in Figure 1, the north pole of the asteroid is on the top of the map. Public images released so far show the asteroid orientated in the opposite direction, with the direction of the Solar System’s north (and for the Earth’s North Pole) at the top. Geographical north and south of the asteroid is determined by rotation. 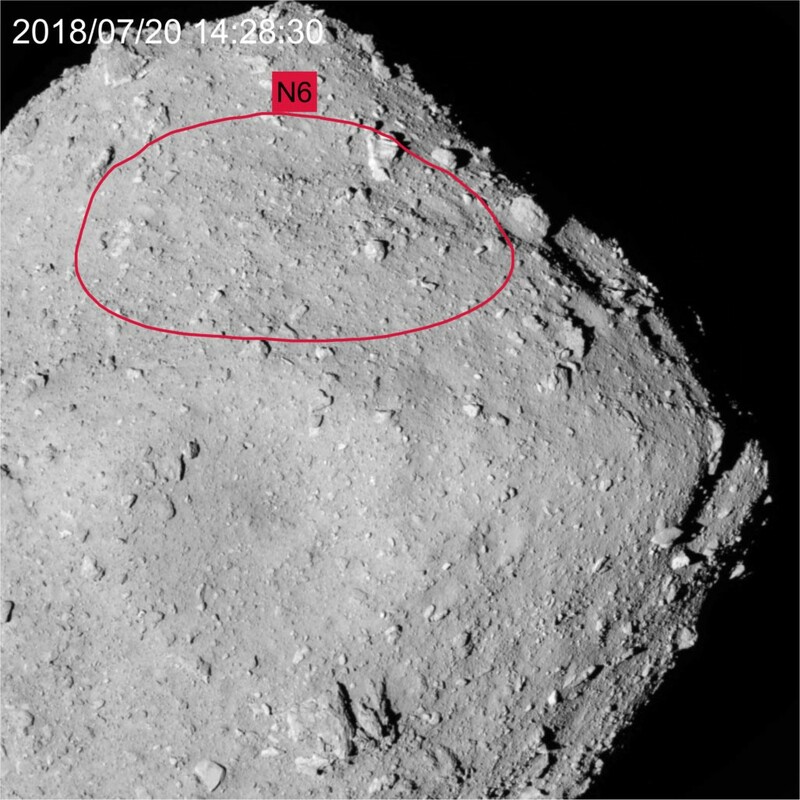 As Ryugu rotates retrograde, in the opposite direction to the Earth and the Solar System, the asteroid’s northern direction is reversed with respect to the Solar System. The situation is the same for Itokawa. An image with the asteroid’s north at the top is therefore reversed compared to an image where the Solar System north points upwards.